This article first appeared on East Niagara Post on March 24, 2015. It is repeated here as I work to put all my book reviews in one place. They will be posted on Thursdays or Fridays and only be altered from the original in that I will add publisher information and pages. Hopefully, by revisiting these reviews, other people might find a book they'd like to pick up for their own enjoyment. As a reader who loves character-driven novels, sometimes I look for a book that I know will be all about the characters. I especially love novels that span a couple generations of the same family. The same family reacting to similar situations, separated by twenty-five and fifty years can be intriguing. Different decades each have their own way of public thinking. For an author, it not only takes the skill to write these different characters, but it also takes the knowledge of historical societal norms. Rebecca Rasmussen’s novel, Evergreen, tackles all this and does it very well. The story begins with newlywed, Eveline Sturm, arriving in the backwoods of Minnesota where her husband, Emil, has acquired a lonely cabin near Evergreen. Continual flooding along the rivers has forced the government to seize property in order to construct a dam to control the waters. These governmental officials are sending out letters warning the occupants of the valley that they really are squatters and that the government is not responsible for any damages incurred by the construction of the dam. The year is 1938 when Eveline’s husband, Emil, is called back to Germany to see his sick father before he dies. The onset of World War II traps him within the German borders. His poor wife is left alone in Minnesota with their newborn son, Hux. While Emil is gone, Eveline befriends the local crazy lady, Lilly, and her family. Lilly helps her in her time of need. That time of need is an unforeseen visit by a governmental assessor. A government man enters the valley to ascertain the value of the lands and homes in the valley as they prepare for the dam. Eveline is polite for her visitor, and when he returns later, she invites him for dinner. He invites himself for more than dinner and leaves Eveline in shambles on the floor….and pregnant. Lilly is there for moral support as Eveline struggles with the idea that she is carrying a child that is not from her husband. Upon the birth of a daughter, she takes the newborn to an orphanage. Her husband can never find out. We skip ahead about a dozen years. Sister Cordelia, at the convent, is trying to steer the life of one young girl, Naamah, onto the straight and narrow. Against all the efforts of the nun, the girl seems to be uncontrollable. No one know who her mother is, but the Sister claims she is probably one of the hangers on from the logging camps who got into trouble and left that trouble on the doorstep. The only clue is the blanket she was found in as a newborn, with the strange word “Hux” stitched on the corner. Naamah, ready to be free of the overbearing Sister Cordelia, runs away into the night. She disappears to the chagrin of the Sister, who actually had her best interests in mind. The young girl takes only what she can carry in her bindle, including her stitched blanket. Again, the timeline is skipped ahead another decade. Eveline, Emil, and Lilly have all passed away. Hux has taken over his parents’ cabin and is best friends with Lilly’s son, Gunther. Together they run amok over the valley in which they grew up. Hux discovers that somewhere in the world, he has a sister who he never met. It becomes his mission to find her. He visits the orphanage where he is introduced to Sister Cordelia. She assumes Naamah went to the logging camps just like her mother because that’s all those women are good for. Hux travels from logging camp to logging camp searching for the lost girl. When he finally finds her, she is a crazed woman inhabiting bars and worksites. Hux takes her back to the cabin where they try to bring their lives together into some semblance of normalcy. At the end of the book, we are jumped ahead in the timeline once again. Hux and Gunther are raising Naamah’s daughter after Naamah disappears. Hux takes his niece to the airport where they each fly for the first time. Hux looks down on the wooded valley that has been his home all his life. Hidden beneath the forest canopy is Hux’s entire life. He realizes life is fleeting and fragile. Rebecca Rasmussen has written a book that takes place over three generations. Starting in 1938, Evergreen takes place over four decades. The same cast of characters are born, live and die in the same square mile of Minnesota. It is an interesting story that will keep the reader engaged. She writes well, with good development, especially with Naamah’s struggles as a teen and young woman. This novel is engaging, pulling the reader into an environment that is simultaneously fascinating and depressing. Probably one of the biggest problems I had with this book was the abrupt changes in the timeline. Rasmussen could have spent more time with these time shifts. She builds a character in Eveline that the reader comes to sympathize with only to write her off with a quick memory of her death later by her son. The same thing happened with Lilly. Again at the end, the time change at the end of the book seems sudden. These transitions were not very smooth. One of the things that seems to have become the norm in contemporary fiction is the idea that all people of faith, or who show religious beliefs are cast in a negative light. It’s happening more and more in new writing. I am not a religious person, but the constant barrage of negativity surround faith in nearly every book is tiresome. Aside from these small criticisms, I really enjoyed this book. I wish she had dedicated a few more pages, or chapters, to building the back story. Another hundred pages could have made this good novel simply magnificent. However, the story was fun to read. The flaws of the characters are well developed with those very flaws steering them toward their ultimate goals. 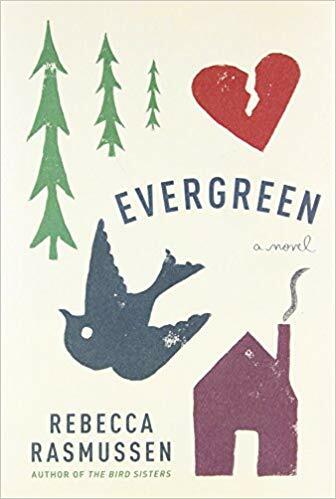 Evergreen by Rebecca Rasmussen is a fine novel. She is an accomplished writer and teaches writing at UCLA. Her previous book, The Bird Sisters, was well-acclaimed and likely will be one the reading list in the very near future. Sometimes, when you find a writer you like, just cross your fingers and hope their other books are just as great as the first time you opened their book. I’m confident that Rasmussen’s other works will be just as engaging and intriguing. Craig Bacon’s life extends over four decades, just like this story. He has no lost children or siblings, but he does have some friends he’d like to lose in the woods.